As I’ve mentioned many times, the discovery of new, uncharted areas, in the realm of jewelry history is always fun, exciting and sometimes excruciating with all the hours sleuthing to create the historical documentation of a single company. Today, two colleagues, lecturer and jewelry expert Kim Dewitt Paff, and jewelry historian Robin Deutch, through separate acts started to put the pieces together of a new jewelry discovery–The Goldstein-Poland Co. Inc. Sometimes it’s as simple as a picture share and a whole new world unfolds. To add to that excitement, I took some time today to learn more about this company. The history is limited, but the fun has just begun! 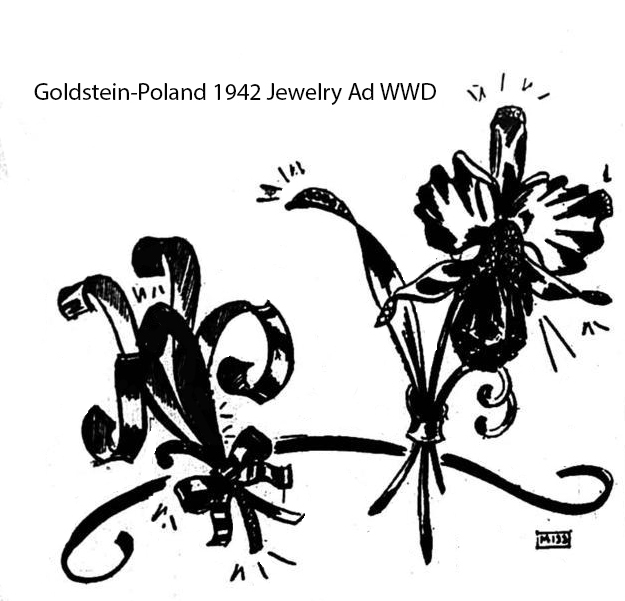 In 1934 Arthur C. Jacobs and Lambert Wallenstein became representatives for the Goldstein-Poland brand—manufacturers of sterling silver and white metal rhinestone jewelry. The company was located in Providence, Rhode Island. Another representative named, George D. Schindler, represented the line out of New York. Mr. Schindler would later go on to become president of Judith McCann Designs: a division of WINGBACK INC. The left piece described as “Rippled bowknots” with a dull and shiny finish in sterling silver. The right brooch is a gold-plated sterling orchid with a large amethyst rhinestone for its center. In May 1942 the company featured a new copper-tone sterling silver finish in its line. The company’s jewelry was designed using one of three different finishes; two-tone gold, all red-gold, or a copper and silver finish. The jewelry was set with “finely faceted stones” in light to dark shades of topaz, amethyst, and green. 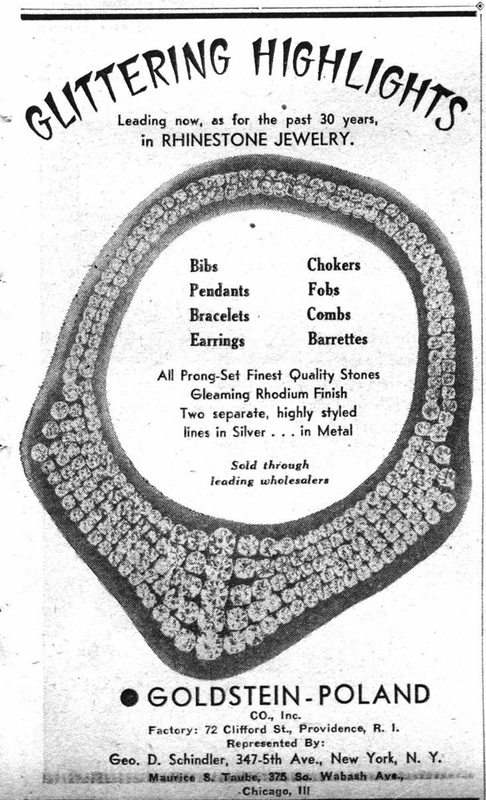 According to the 1942 trade magazine, Women’s Wear Daily, three primary motifs “orchid rose, tulip and pond lily” made up part of the upper-end line. These pieces featured large “deep-color” stones flanked by pave-set rhinestones in lighter complementing shades. Also made in the fine jewelers’ tradition, its bow-knot motifs, which ranged from modernistic to romantic had the same choice of finishes. The company featured matching figural earrings or hoop designs. In addition to traditional figural motifs, the company made wartime designs that included Service Star and Victory pins. These pins were featured during the 1942 American Retail Jeweler’s convention held in New York’s Waldorf-Astoria. The company also featured as part of its “plain sterling” bird and floral motifs for bracelets. In 1943 the company’s line included lapel pins, floral sprays, and watch mountings all in gold-plated sterling with imported stones. Floral spray pins were designed with “movement” and were accented with “faceted jewels” and rhinestones.